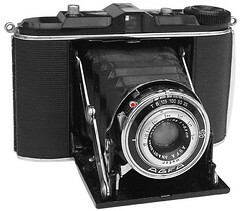 The Agfa Isolette (Jsolette)  is a horizontal-folding medium format camera made by Agfa Kamerawerk AG, Munich, Germany. 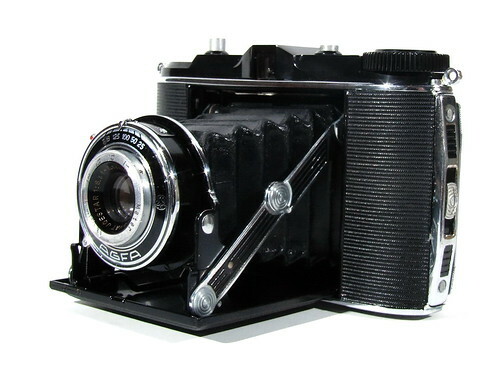 This folding camera first came on the market as the Isorette (Jsorette) but the name changed to Isolette (Jsolette) quite soon. From late 1937 the name writing form of I (like J) changed again to Isolette. 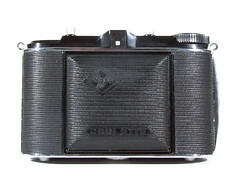 This means that very early 1936/37 models have a Jsolette writing on the front plate leatherette of the camera. Isolette production lasted till 1942. 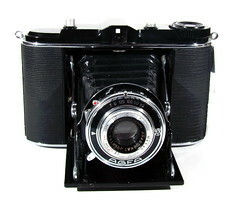 This model was called in Germany during the WWII times the "Soldatenkamera" (Soldiers' Camera) also. One of the very distinctive feature is the top-plate which is made of a plastic called "Trolitan". There were many different lens/shutter combinations. All Isolette series produced between 1936/37-1950. 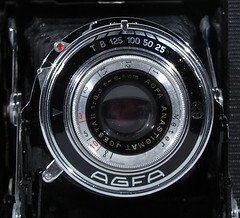 Agfa Isolette (Jsolette), 1936/37, early model, from the first production year of the Isolette series. This data belongs to the camera Isolette (Jsolette), early model, 1936/37, in the pictures. Shutter: Vario, speeds: 1/25-1/125 + T&B (no click stops, also offered with Pronto, Prontor II, Compur or Compur-Rapid. The camera in here is from the first production year of the Isolette series. The Vario shutter is on very early models which name's writings as Jsorette and Jsolette, but there is no shutter name on the lens-shutter barrel. On the early Jsolettes/Isolettes the front focusing element were frozen in time which is apparently typical. Top plate cast-Hydronalium alloy (Nüral).